Three popular artistes of the country Tariq Anam Khan, Dolly Johur and Suborna Mustafa will share the screen together in an Eid special drama. 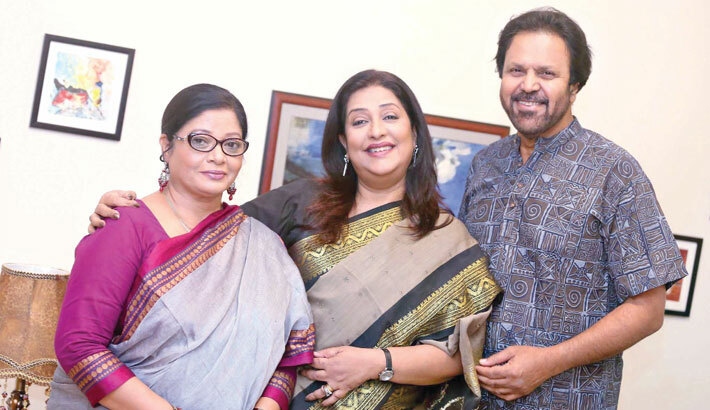 Audience will be seen this trio in the drama titled Kono Ek Boroshai under the direction of Chayanika Chowdhury. Story from Badrul Anam Saud, Suborna Mustafa has written the script of the drama herself. The shooting of the drama has already been completed at a shooting house in the capital’s Uttara area on yesterday. Commenting about the drama Tariq Anam Khan said, “After a long times I have worked in an amazing drama. The script of the drama is also wonderful. Director Chayanika Chowdhury has done his work very carefully. I hope the audience will enjoy the drama very much”. On the other hand, Suborna Mustafa and Dolly Johur also very hopefull about the drama ‘Kono Ek Boroshai’. The drama Kono Ek Boroshai will be aired on ATN Bangla on the occasion of upcoming Eid ul-Fitr, said the director Chayanika Chowdhury. Faria Hossain is the executive producer of the drama.